How do I start a big dance in Miku Miku Dance 7.39? How do I plan a big dance project in MMD? 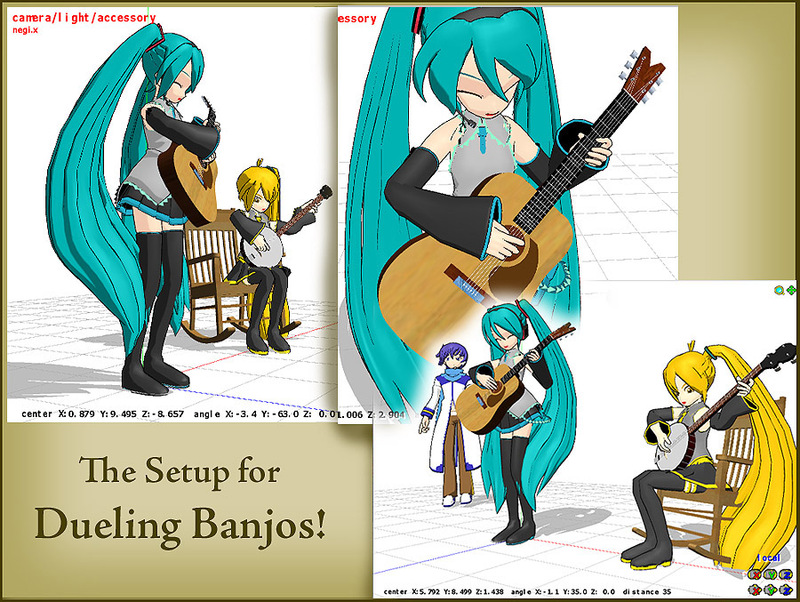 I had the inspiration to create a Dueling Banjos animation with the standard models available in MMD. It’s going to be quite a project … and I don’t know if I will actually finish … but I am off to a good start! 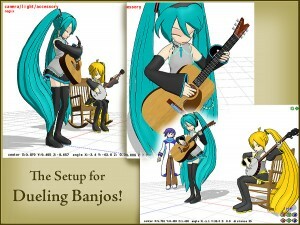 Click to see FULL SIZE my original model setup for my "Dueling Banjos". It seems that Neru is often the nemesis of Hatsune Miku … so she’s the obvious choice for the little guy in the rocking chair … the object of the “duel”. I found the film clip of the scene from “Deliverance” and noted that Kaito could be the character doing that goofy dance seen in the background of that clip. I searched Sketchup for instruments and the rocking chair and used the 3D-Rad plugin to make DirectX models that I can use in my animation. I had to modify each model in Sketchup to adjust colors, adjust the size, and, for the banjo, add strings, before making the conversion. Setting up the stage with the characters and the accessories was fun and time consuming. Click on the picture, above, to see the result. That is my Frame Zero, so far. The tempo of the music is constantly changing throughout the length of the piece. I have decided to add a Leek (the Negi accessory) that I can swing like a metronome to keep time with the music … and that will be my first animation sequence: swinging that Leek in time to the music for the entire length of the piece, changing the pace as required. 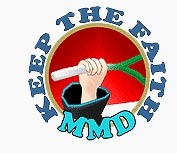 After that, I plan to time my motions to the Leek rather than trying to listen to that music over and over for the next month or two.